On a lush, green land lived a kingdom of deer….Among the herd was a handsome prince with the most stunning and powerful antlers. This handsome deer prince, Stag, was to inherit the kingdom...but little does he know, being king is a lot of work. And by a lot, I mean a lot . He was selfish and he only cared about his antlers. But his father decides to retire anyway and Stag inherits the kingship,and with the crown came all of the responsibilities attached. But is young Stag ready for such a responsibility? Could he handle the herd in times of trouble? Well, one thing’s for sure – he’s about to find out. While King Stag was busy preservation the beauty of his antlers, an unexpected crisis arose. I rather enjoyed this one! It was fun, sweet and, above all, truly a delight to read. I love how there’s a moral to this story but it’s not told in a patronizing or pandering way. The young king is put into a situation where he has to decide – his vanity or the fate of his herd? 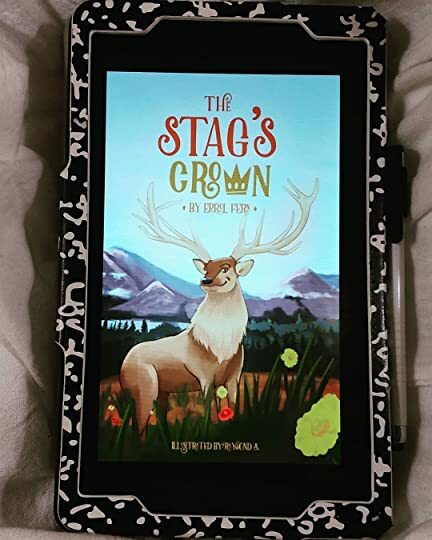 Stag was given a choice to rise to the occasion or let his people suffer – and I thought this book sends an excellent message to children, that sometimes you just need to step up and do what’s right. I thought the illustrations were nice, though I’m a bit partial to the illustrations in Caterpillar (Fern’s first novel). Also, and this is a teeny-tiny thing on my part, but deer regrow their antler’s every year. So Stag’s actions turns more into well-there-goes-this-year’s-antlers rather than a permanent sacrifice. That being said, I don’t think kids or most people will interpret it that way and I think the message Fern sends out should be taken to heart – that helping others, particularly family, is absolutely essential. This is my second novel by Errol Fern and I’m absolutely excited to see what he writes next.